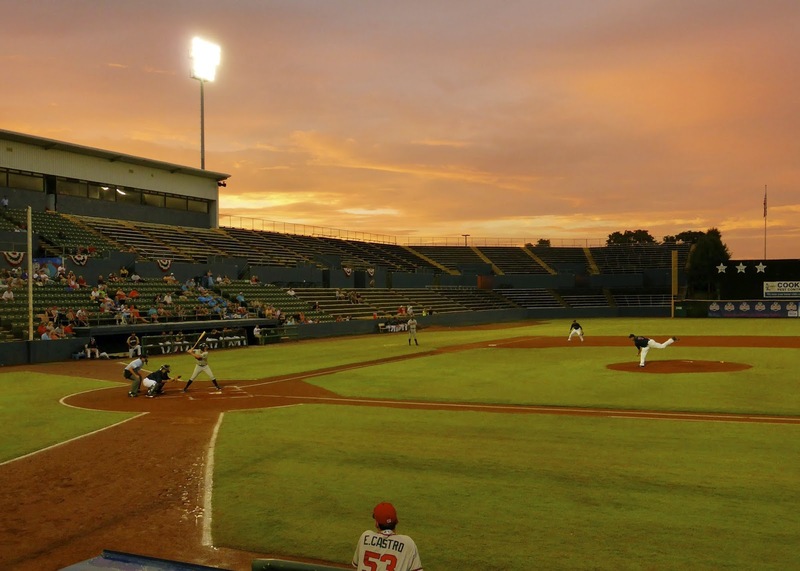 The whole reason I found myself in Alabama this past weekend was to see a game in Huntsville, whose AA Southern League franchise will move to Biloxi in 2015. Joe W. Davis Stadium will end its run as a minor league facility in the upcoming playoffs, but I couldn't plan for that, so I chose Labor Day weekend to fly down to pay my respects. 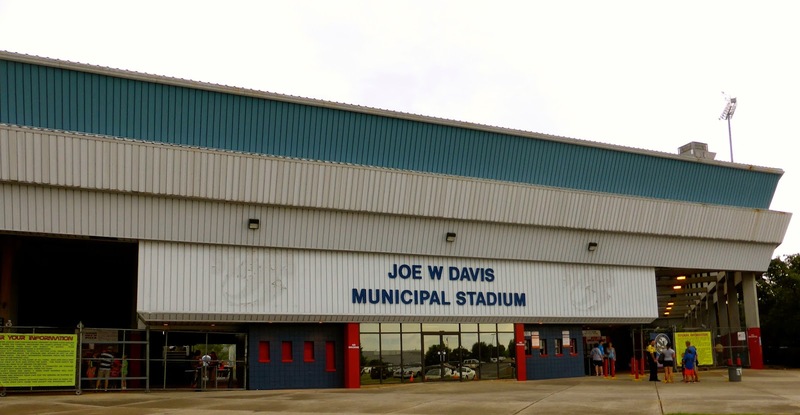 Opened to rave reviews in 1985, Joe W. Davis Municipal Stadium is named for a long-time mayor of Huntsville. 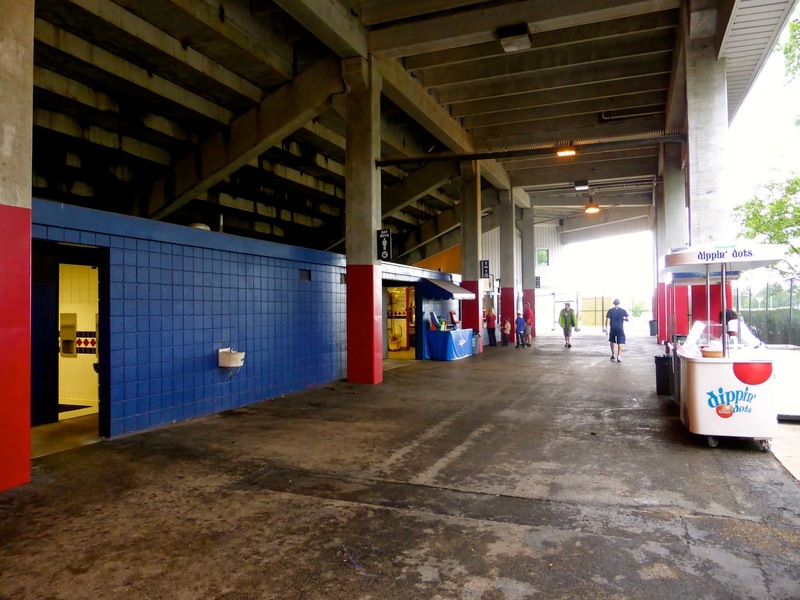 It was once considered the best ballpark in the league, but as retro parks became the rage over the ensuing decades, "The Joe" fell further and further behind. Although some renovations were made in the intervening years, the park was unable to add critical amenities and attendance plummeted. In 1998, the Stars drew 4,044 per game but just 12 years later, the average was down to 1,404. On this night, the second last day of the regular season, only 924 showed up. It makes no sense to write about the stadium in terms of a review, since it will no longer be in use once the Stars are eliminated from the playoffs. It is a bare bones facility with a few concessions. The dill pickle at $2 is the food bargain while $2 beers before first pitch were the highlight for the drinkers, especially with a 3-hour rain delay. There were no silly promotions between innings, just a chance to update the scorecard without loud music and enjoy the beauty of a old-time ballpark. It may sound strange calling a 1980s stadium "old-time", but this place reminded me of Nat Bailey Stadium (opened 1951) in Vancouver, which I visited often over 20 years ago. Back then, the game still was more important than the experience and that seems to be the way that the Stars approached things. These days, though, fans want more. The picture below captures the sun setting over Joe W. Davis Stadium, both a literal and figurative interpretation of what transpired during my visit. 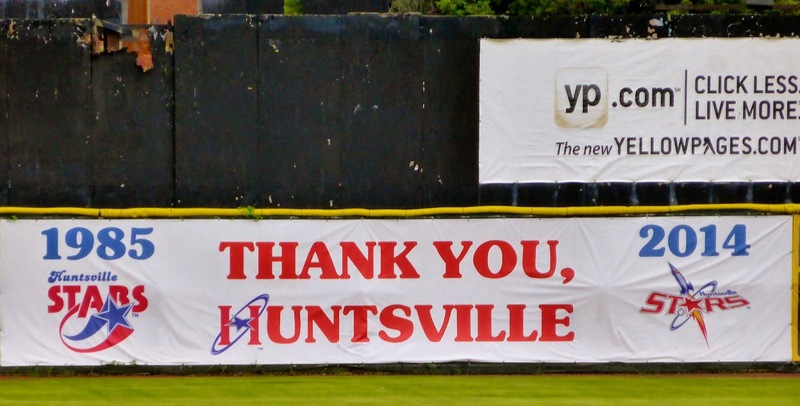 Huntsville, you will be missed on the minor league circuit. Good luck in the playoffs! It was a doubleheader as Saturday's game was postponed, meaning I would see five games in just three days in Alabama. 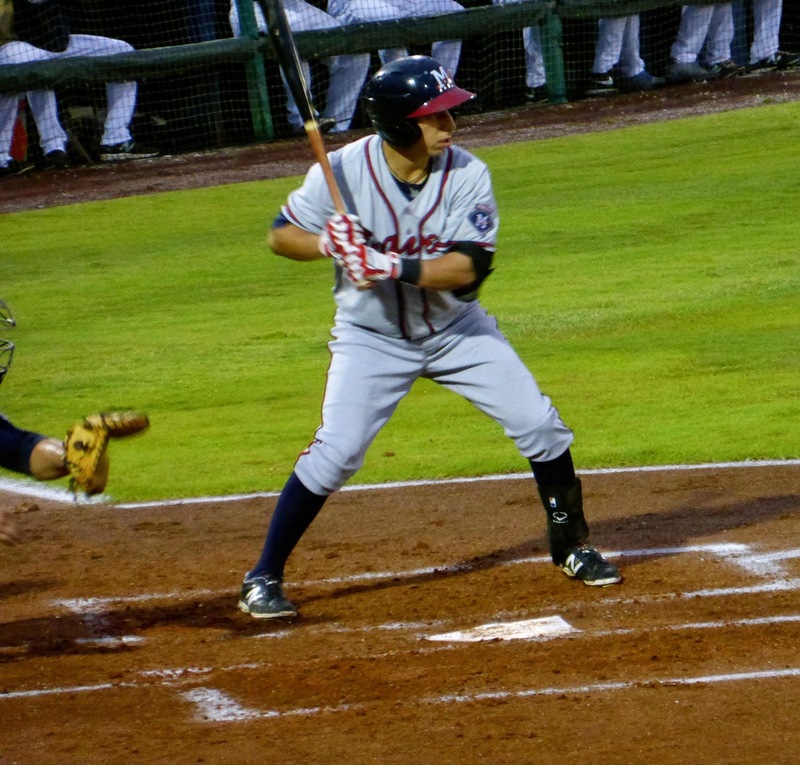 The Mississippi Braves were visiting and they still had a chance to win the second-half Southern Division crown. Yes, the Southern League has a Southern Division. Anyway, Saturday's game was rained out, so I was fortunate to have a doubleheader, scheduled for 4 pm. I arrived about 30 minutes before and made my in, only to see the tarp on the field. 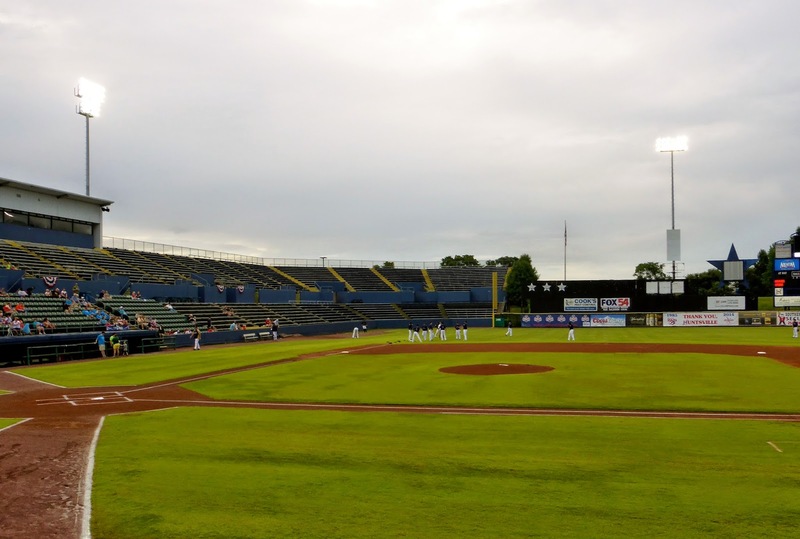 It wasn't raining at the time, but shortly thereafter the skies opened and declared their reluctance to seeing the end of pro ball in Huntsville. I went back to my car to charge my phone and listen to the local radio. After a couple of hours, the rain stopped and the field was fixed up, with first pitch coming at 7:05. 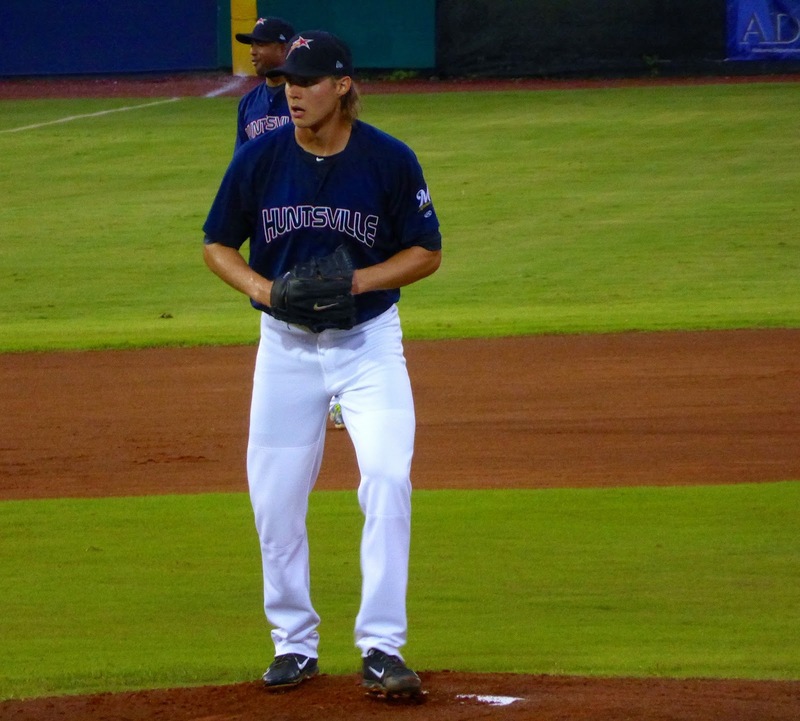 Mississippi scored three in the first on three hits and two Huntsville errors that did not make starter Jed Bradley (15th overall from the Georgia Institute of Technology (GIT), 2011, below) very happy. Williams Perez, a Bartolo Colon wannabe, got the start for the Braves and lasted all of two pitches. Nick Shaw (25th, 2010) lined one that hit Perez in the ankle and forced him out of the game (below). Adding insult to injury, Shaw eventually scored an unearned run but emergency reliever Andrew Robinson (12th, 2010 by Houston, also from GIT) threw 3 strong innings, yielding not a single run of his own. Robinson even doubled and scored in the second as the Braves added to their lead. A homer from Barrett Kleinknecht (12th, 2010, 11 spots after Robinson) made it 5-1 and then a single by Daniel Castro (below) was followed by a triple from Braeden Schlehuber (4th, 2008) that salted the game away. Bradley was replaced by Michael Strong (10th, 2011) who was making his AA debut and showed no signs of nervousness, walking 1 and striking out 6 in four hitless innings and winning the Player to Watch award. 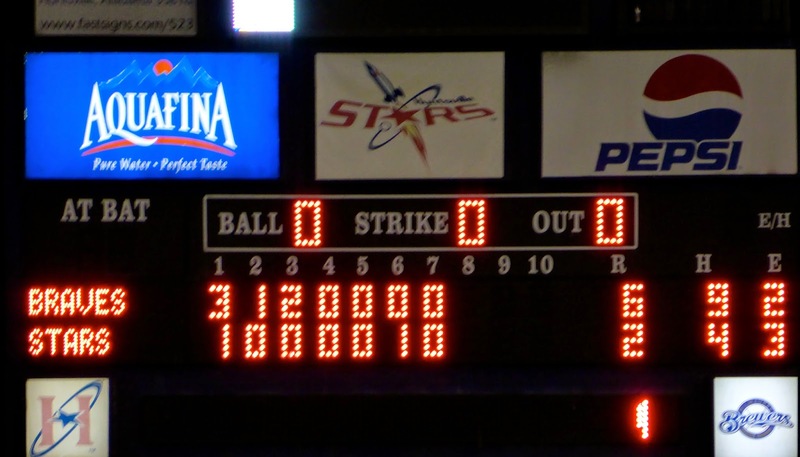 Huntsville managed a run but that was it as they fell 6-2 in a game that took 2:22, quite long for a 7-inning affair. This pushed the start of the second game until after 10:00. It was also a 6-2 game, this time in Huntsville's favour. I didn't bother scoring as I had to leave to drive back to Atlanta to catch a 6:45 flight. It is about 3½ hours and one time zone over, so 12:30 was my limit if I was to make it to the airport by 5 a.m. Fortunately the game lasted just over 2 hours, finishing around 12:10. I made the drive back through rural Alabama during the early hours of September, and passed very few cars along the way. I never advise nighttime driving, because you miss the scenery and this is one case where I wish I could see what I was passing through. It was a tiring drive and as soon as I boarded the plane I nodded off, waking up as we landed in New York. It was a bit surreal to have been in Huntsville just 8 hours before flying past Manhattan. 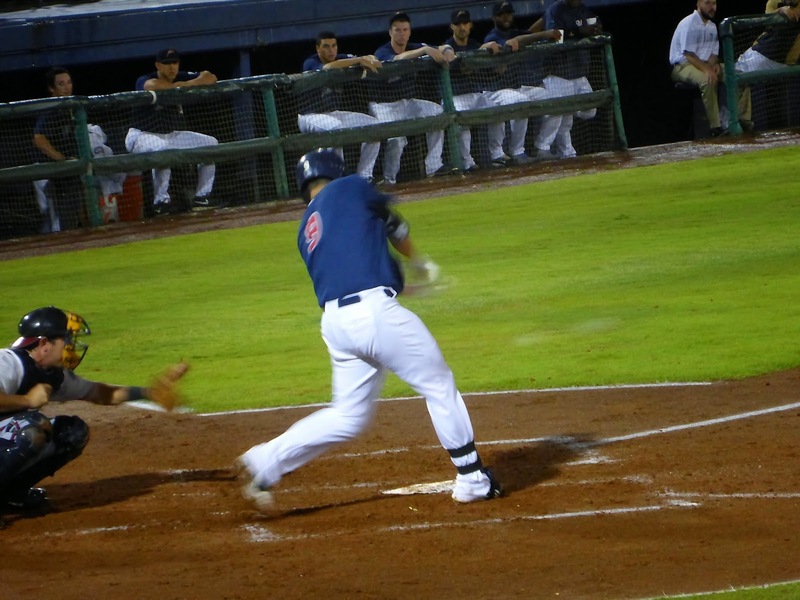 Nick Ramirez (above) played first for Huntsville and will be off to the Arizona Fall League next month. Ramirez played for Team USA in Japan and was the losing pitcher in the gold medal game. Mississippi ended up finishing just out of the playoffs, a game behind Jacksonville who ended the season on a 10-0 streak. A quiet month ahead as I only have to return to Buffalo to make amends for calling Bills fans the drunkest. Before that though, I plan to write a few items on all the problems with sports, so keep checking back regularly as I get older and grumpier.